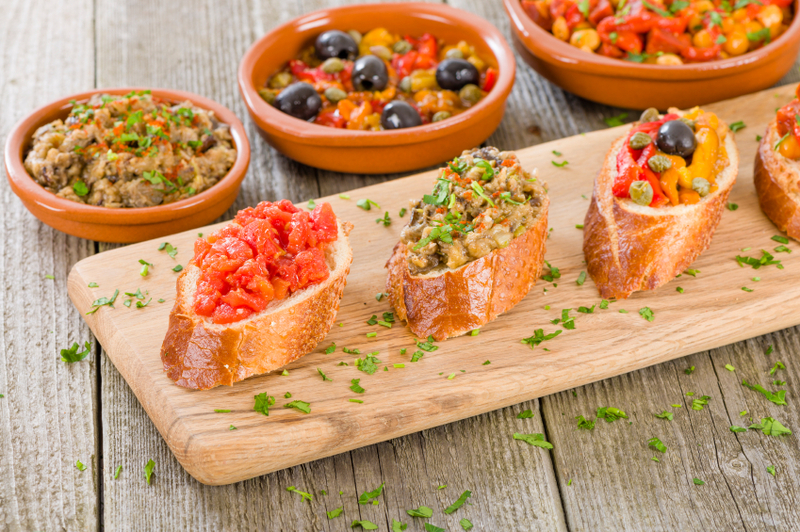 Tapas foods are finger foods that are served in cafes and bars. The word tapas comes from the Spanish word, tapar, which means, “to cover.” Coming in various different forms, tapas fare can be hot, cold or marinated. Tapas are usually flavored with cumin, salt, pepper, garlic, chilies, paprika, saffron or olive oil. Possible dishes include olives, Serrano ham, chorizo, salt cod, Spanish omelets, rings of battered squid, meatballs with sauce, stuffed mussels, stuffed piquillo peppers, and much more. In many parts of Spain, if you order a drink at a bar, a tapa is served with it for free. Fun Appetizers--For Adults AND Kids ! Appetizers Are Fun....and Delicious ! !